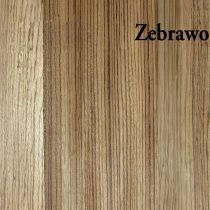 African Zebra Wood is grown in West Africa. It gets its name from the distinctive narrow stripes of golden yellow to near black. This hard, dense and heavy wood is used for decorative turning, furniture, inlays, sculpture and boat building. S4S means this hardwood has been surfaced on all four sides. This board has a cleaner appearance than S2S1E. Available in 4/4 thickness, 1-1/2″, 3-1/2″, 4-1/2″ or 5-1/2″ wide, and 3′ to 8′ long.